International in scope, critical in character, and thoroughly engaged with the critical issues that confront today’s society, this journal is founded on the essential proposition that no single approach to the practice of international politics offers all the answers. 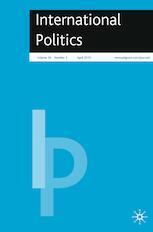 International Politics is a trail-blazing, peer-reviewed journal dedicated to exploring transnational issues and global problems. Espousing no specific political or methodological stance, the journal welcomes appropriate contributions that communicate findings and provoke deeper dialogue. Among topics discussed in the journal are the relationship of Putin and the West; China’s chances to prosper peacefully; the concept of just war; prospects for Cuba today and post-Castro; and the possibility that American is in decline. Coverage extends to such topics as image politics in Germany; international human rights; nuclear power in Japan and more. The journal is designed to provide a global forum for a burgeoning community of scholars from across the range of academic disciplines.